The Ricardus Dialogue (University of Rochester, D.460 1000-003) is … well ... not much to look at. One curator once commented upon seeing the poor manuscript “I can’t believe the university’s library accepted that”. To which PhD candidate Kyle Huskin kindly comforted her “well, it was a gift, I believe”. The manuscript leaf under question is almost entirely illegible. Almost every sign of text has faded or completely disappeared. The document was likely used as a binding fragment. Parchment was used to support bindings on early print materials or protected the printed text as a soft binding on the outside of the work. Such hard use rendered many manuscripts, including this one, into a damaged state. The University of Rochester's Rare Books, Special Collections, and Preservation, in fact, appears to house a dirty, stained, basically blank parchment leaf. However, through the wonders of multispectral imaging and the diligent hard work of two University of Rochester English Department PhD students Kyle Huskin and Alex Zawacki, the manuscript has new found significance. The Lazarus Project, a multispectral imaging initiative now based out of the University of Rochester, photographed the document in spring 2016 and again the following year. After processing these images, Lazarus Project team members were able to render the manuscript entirely readable. They recovered almost every part of the missing text. Kyle Huskin and Alex Zawacki (the PhD students mentioned above) used these images to identify the newly legible material as the oldest surviving copy of the works by Richard FitzRalph, Archbishop of Armagh, in the US and possibly in the world. After this success with multispectral imaging (MSI), the Ricardus Dialogue seemed a prime candidate for testing out hyperspectral imaging (HSI). Spectral imaging consists of taking photographs under controlled bands of light which can then be recombined through statistical processing which can reveal data about the object under investigation. MSI in cultural heritage largely focuses on recovering damaged or faded illegible texts. The Lazarus Project MSI system, for example, captures 44 distinct photographs per each imaging sequence under different light waves. HSI can capture over 900 individual images, but works slightly differently with different goals. To gain the spectral resolution (the increased number of light waves), the photographs lose spatial resolution (what we normally think of as resolution). This is partly related to the fact that HSI systems utilize a scanning camera instead of a high resolution DSLR. The biggest difference between the two systems lies in their end goals: MSI seeks to recover texts while HSI aims to provide enough spectral resolution to analyze the physical materials of the document. However, these systems have just not been around that long. So what I should have said above is that these differences are what is supposed to separate the two types of systems, but, until this summer, no one had tested one document on both HSI and MSI to examine the real, practical differences in imaging modes. 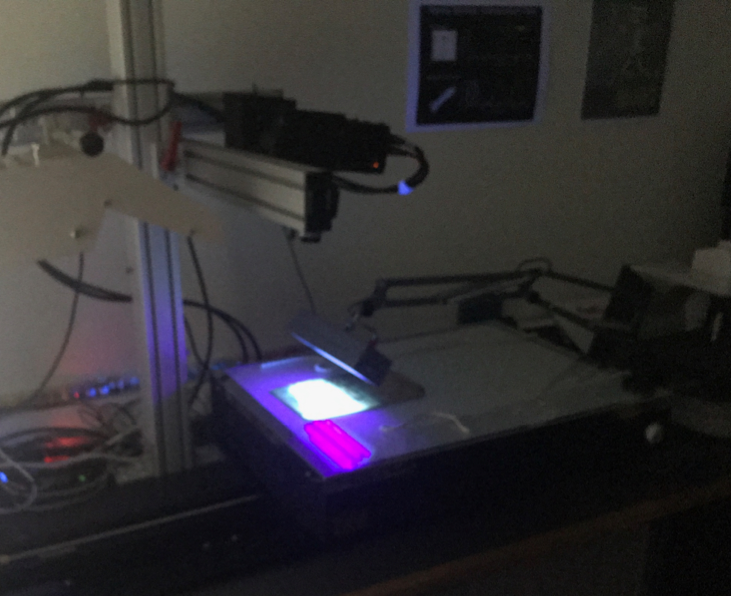 Three PhD students in the English Department at the University of Rochester went to England this summer with the Ricardus Dialogue to test out hyperspectral imaging on a manuscript with well-studied MSI results. Helen Davies, Alex Zawacki and Kyle Huskin arranged to fly from Rochester, NY to Oxford, England with the manuscript so that it could undergo HSI at the Bodleian Libraries with David Howell. 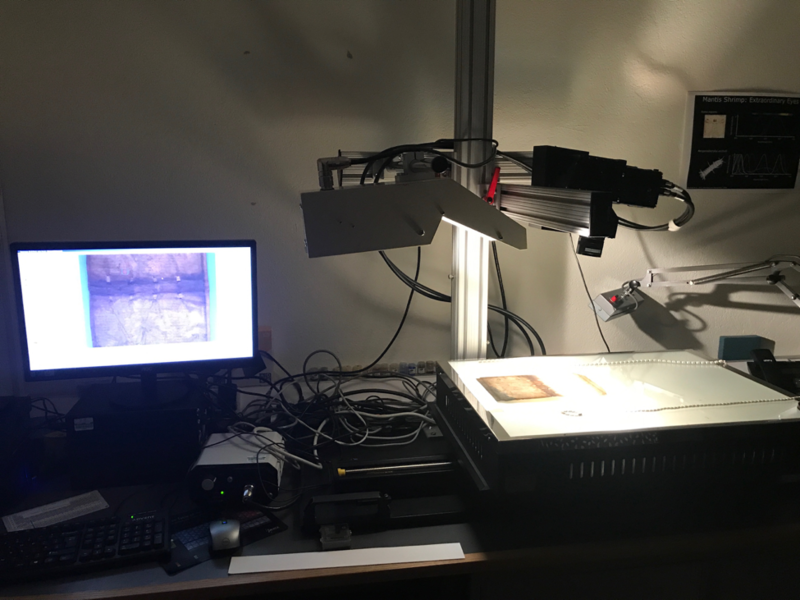 David Messinger, director of the Chester F. Carlson Center for Imaging Science at the Rochester Institute of Technology, met the students at the Bodleian with another manuscript to image under the hyperspectral system. Steven Galbraith, Curator of the Cary Graphic Arts Collection at RIT, generously lent this additional manuscript which will soon (this week!) 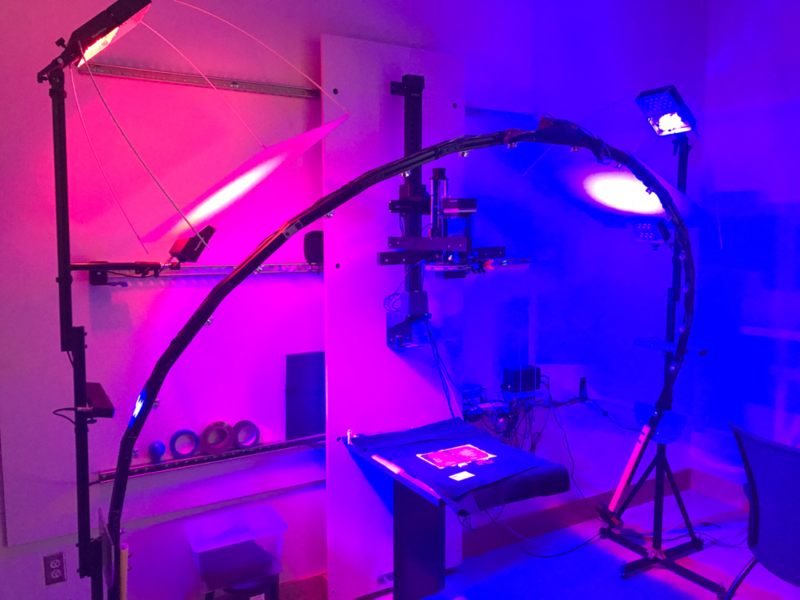 undergo multispectral imaging at the University of Rochester with the Lazarus Project. The team collected the HSI data for these two manuscripts and will very shortly begin the interesting challenge of processing these images to investigate the difference between these two types of systems. The above image shows the Ricardus Dialogue on the HSI system. Above the manuscript, you can see the camera and the light source. Unlike modern MSI systems, a broad band white light shines on the manuscript which the system then filters out. The visiting UR students were very impressed by the small size of the HSI system. The Lazarus Project with PhD students Kyle Huskin, Alex Zawacki, and Helen Davies look forward to processing this new HSI data and comparing it with MSI. Thank you to the University of Rochester English Department for summer funding that made this trip possible! Thank you also to Jessica Lacher-Feldman, Director of Rare Books, Special Collections, and Preservation, and Anna Siebach-Larsen, Director of the Rossell Hope Robbins Library for encouraging this research through the generous lending of the Ricardus Dialogue. We appreciate the collaboration with David Messinger, RIT, and Steven Galbraith, Curator of the Cary Graphic Arts Collection.